Wynnum West is located in Brisbane Bayside, and is a fast growing suburb with a mix of high set chamfer board and brick houses. A lot of new developments are being built with townhouses and units. The high set chamfer board houses at the time were built with galvanised water pipes. The water in Wynnum West is considered to be hard to moderately hard. When maintaining a property in Wynnum West it is important to consider these two factors in relation the plumbing of the house. As a lot of the houses in Wynnum West are more than 3o years old, there is a lot of galvanised water pipes used in the plumbing of the houses. Galvanised water pipes are made of steel with a zinc coating. At Ryan Old Plumbing we recommend replacing all galvanised water pipes with a combination of copper and plastic pipes. As licensed plumbers we can recommend the best water pipes for each location of the house. Contact us to arrange a local plumber to some out to your property for a quote to replace your galvanised water pipes. Over time these galvanised water pipes can have a build up of internal rust and calcification causing low water pressure. Over time the buildup on the inside of the pipes will restrict the water flow, this coupled with the thinner diameter water pipe results in low water pressure. As Wynnum West has hard to moderately hard water, the minerals in the water can react to the materials in the pipe and change the taste of the water. Replacing older galvanised water pipe can greatly change the taste of the water. Rust in the water pipe can also change the colour of the water, resulting in dirty brown water coming through the taps and toilet. This can stain the hand basins, showers and toilets bowls over time. A licensed plumber can isolate the source of the rust and replace the rusted pipes and fittings. Due to the age of the properties in Wynnum West, the internal fittings of taps and showers can corrode and through normal wear and tear the tap washers can deteriorate. A licensed plumber can quickly ascertain the source of the leak and change any internal fittings or washers. Our local plumber carries a large range of fittings to ensure that all work can be carried out while on the premises. The major source of blocked drains are tree roots and debris entering the drain pipes underground on the property. More established properties in Wynnum West have large trees with well established root systems. These roots are attracted to the water in the storm water pipes and the sewer lines and can crack the pipes and grow into the pipes restricting water flow. Modern technology allows for devices to make the location and clearing of tree roots on the sewer lines and storm water pipes quicker and less invasive to the property. At Ryan Old Plumbing we use CCTV technology to source the blockage and then we use the Jet Rodder to blast out the cause of the blocked drain. 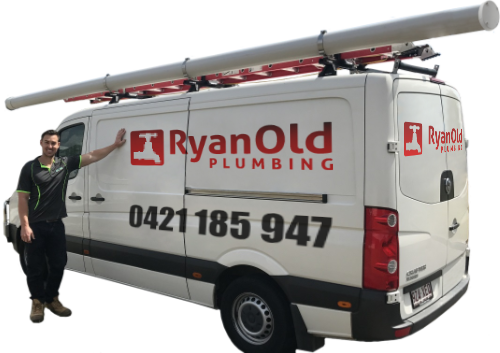 Ryan Old Plumbing have a team of local plumbers ready to assist you with all your plumbing needs. Our vans are stocked with pipes, fixtures and fittings and can attend to most minor plumbing jobs on the initial call out. For larger jobs a proposal outlining the work to be carried out, cost and time frame is supplied. Call your local plumber on 0421 185 947 to discuss your plumbing needs. Often blocked drains are a result of corrosion and rust build-up inside of old galvanised pipes. The blockages cna be cleared, but often it is better to fix the root of the problem to eliminate continual blockages. Often things are not as they seem. what can be thought of as initially blocked gutters can actually be a deeper underlying issue. We organised a site visit to be scheduled to visually inspect the property, specifically the area which the home owner was requiring the new gutter and downpipe. One morning, a frantic customer called and shared her concern of a leak in the wall of her bathroom. One morning, a customer telephoned after receiving a building and pest report and the report suggested that there may be drainage issues at the property he is planning to buy. Late one afternoon, at around 5:00 pm, we received an emergency phone call requesting a plumber local to Cannon Hill. The caller was in a state as they shared that their hot water system had burst. Ryan Old Plumbing was contracted by a Real Estate Property Management to carry out a water compliance test for one of the Cannon Hill properties they handle to ensure it was ready for occupancy. We received a call from a landlord regarding one of his properties. He mentioned that the overflow pipe for the hot water system won't stop running. An elderly lady called in and requested the services of a local plumber to replace her kitchen sink mixer as it had been continuously leaking.